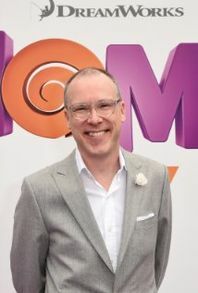 Tim Johnson has a dream job that most kids only dream about – he is an animated movie director for DreamWorks Animation and has worked on such fantastic films as Antz, Sinbad: Legend of the Seven Seas, Over the Hedge, and Home. 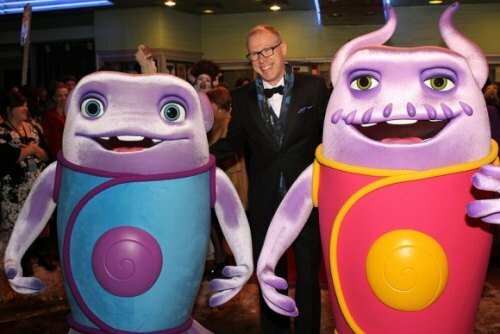 He also was Executive Producer for the 2010 hit How to Train your Dragon. Mr. Johnson has won many awards for his work including two Annie awards, an Audience award, and a Grand Prize. An interesting tidbit on him is that he directed the first computer generated Pillsbury Doughboy commercial. After graduating from Northwestern University with a B.A. in English Literature he began his career as an animator and producer. Two years later, his introduction to computer animation came in 1985 while he was on staff at Post Effects in Chicago, a television production, post-production and special effects facility. He continued to take the world by storm from there, starting a character animation department at a company and eventually being hired by DreamWorks Animation. The film Home was recently released on DVD so we had an opportunity to speak with Mr. Johnson about his work on this film as well as his other projects. I hope you enjoy our conversation as Tim shares his extensive knowledge of the film industry and his career with us. AK: When did you decide you wanted to be a director and what characteristics about directing attracted you to that career? How did getting a B.A. in English Literature play into this decision? TJ: I grew up addicted to story. It didn’t matter whether it was a book, a movie, or my high school geek pals playing Dungeons & Dragons. Storytelling was everything. So studying English Literature was a natural extension of that fascination. And directing movies was the ultimate playground for story. I love the art of animation, the collaborative process of filmmaking, and making movies for family audiences. AK: Why do you choose to be involved with animations versus real life movies? TJ: I feel like animated filmmaking is the purest form of storytelling. More than live-action, animation allows you to create characters, a world and a tone unique to that film. And as live action films have gotten dumber (just one man’s opinion! ), animated films have gotten smarter and more entertaining. AK: In addition to Home you have been involved with other DreamWorks movies including Antz, How to Train your Dragon, and Over the Hedge. How did you first get involved with DreamWorks? TJ: Back in 1994, I was working at the computer animation company Pacific Data Images. I had directed TV commercials and television. But I really wanted to break down the door to feature films. I wrote a script for an original animated feature and pitched it all over town. When I met with Jeffrey Katzenberg in early 1995– it was a perfect match. 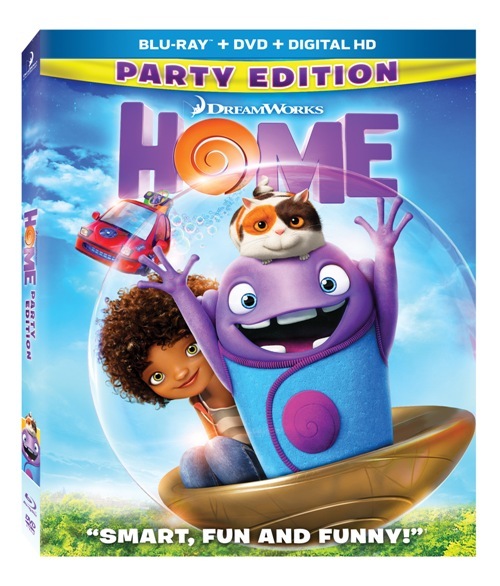 AK: Were you involved in the decision by DreamWorks to create Home? If not, how did you end up being selected as director for this movie? TJ: I read Adam Rex’s novel, The True Meaning of Smekday, aloud to my young boys. I fell in love with the characters and the quirky comic tone. So I brought the book up with my DreamWorks team, we optioned the book and started development. Seven years later, we had a finished film! AK: How have the advances in computer animation changed your options for characters and scripts? I understand you used a new film technology in this film called Apollo. What did this allow you to do differently in this film? TJ: Our new tools allowed the artists to experiment and improvise more than any time in the past. The technology allowed animators to get much more footage done in much less time. AK: Where do you see animation heading in the future? TJ: It might sound cliché, but the only limit to computer animation is the imagination of the filmmakers. You can truly accomplish anything visually with these tools today. But, telling a great story – that’s still a timeless challenge. AK: You have worked both as a producer and an executive director. Can you explain the difference between these roles to our young readers? Do you prefer one role over the other, and why? TJ: Directing a feature animated film is the coolest job – Ever. No question. You get to work with a team of up to 300 amazing fellow artists and tell a story for the big screen. Every day is an exciting challenge. When you are the director, it’s your job to clearly share the vision for the film. It’s like being the conductor of an orchestra. You may not play the violin, but you help all the violins play beautiful music together. Being an Executive Producer is like signing on to be a film’s grandparent. You don’t get to raise the child, but you are there to support, guide and advise the director. AK: I look at Home as a “buddy movie”. What do you think makes Home stand out from the other buddy movies that have been made? TJ: I think Home works as a comedic mash-up of genres. It’s a post-apocalyptic, science fiction, road-trip, comedy adventure buddy-movie! AK: Home took 7 years to make. What were some of the challenges that caused this amount of time? TJ: The first half of that span of years was spent exploring the adaptation of the novel to the screen. Lots of discoveries and changes were made to create the best film-version of the story. But the last three plus years were spent in production, which is pretty typical for an animated movie. Our biggest challenge was crafting the opening scenes. How do you introduce the Boov, Oh, Tip and all the back-story of the Boov fleeing the Gorg, and make it all interesting, funny and heartfelt? We ended up with over 12 different openings over the years, before settling on the one you see in the final film. AK: The score is such an important part of this movie to bring out the emotions. How were these songs developed to match the script? TJ: Songs were a key ingredient in the story of Home. We worked with an amazing team of songwriters, lead by our core producer/composer team of Stargate. Under Rihanna’s supervision as well, we worked with over 50 original songs composed for our story, before selecting the 10 songs in the final score. AK: Now that Home has just been released on DVD, what are your next steps? Are you looking at a sequel or what other projects will you be working on? TJ: I’m always thinking of the next story, the next film, the next idea. 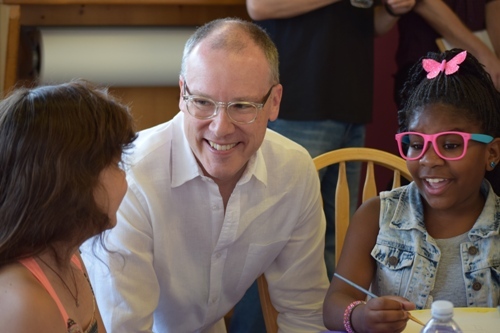 There are some exciting new stories I’m interested in – stay tuned! AK: Do you have any advice for aspiring film directors? What skills or characteristics should youth strive to develop to be a success in animation? TJ: There are so many options available to young filmmakers today. It’s possible to make a film with only a cell phone and some simple editing software. So I subscribe to the Nike formula – Just Do It! Make films. Draw pictures! Write music! Edit images! Photograph! Create! AK: Who has been a mentor to you during your career that has made a difference? TJ: I’ve had so many wonderful inspirations and fellow artists guide my path. But no one has had a more profound influence than our leader here at DreamWorks Animation. Jeffrey Katzenberg has been a patient, inspiring, demanding, often frustrating mentor to me. I love making movies with him here at DreamWorks! To see some of Tim Johnson’s work, the Home DVD/Blu-ray sets are available for purchase at a store near you, or on Amazon. 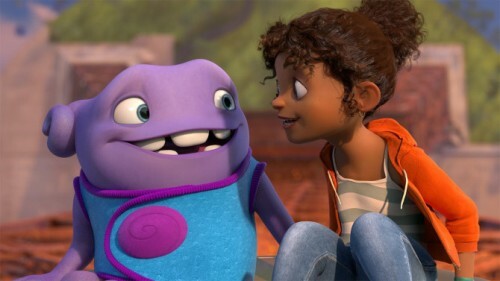 For a review of the animation movie Home, see our Movie Review column or follow the link here.